Why buy cereal when you can make this yourself? The plums bring just the right mix of acidity and sweetness. Preheat the oven to 150˚C/gas 2. Line a large baking tray with baking paper. Place the butter, sugar and cinnamon in a large pan over a medium heat. Stir until the butter has melted and the sugar has dissolved. Turn off the heat, add the oats and almonds and stir until coated. Spread the mixture evenly on the baking tray. Bake for about 30–35 minutes, stirring occasionally, until lightly browned. Allow to cool completely. To roast the plums, preheat the oven to 200˚C/gas 6. Place the plums cut-side up in a roasting tin and drizzle them with the honey. Roast for 15 minutes, or until the plums have become soft. 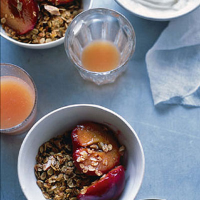 Serve the granola with the plums and scoops of yogurt. Any leftover granola can be stored in an airtight container. Freshly squeezed juice will suit this lighter breakfast dish; orange juice is good, but you can ring the changes with this sharper alternative. Freshly Squeezed Ruby Grapefruit Juice (£1.99/500ml).